There’s a labor shortage in the hospitality industry. You could scribble your resume on a Do Not Disturb sign and get a job. There’s a lot of bad companies out there. They don’t pay well. They think you’re disposable. If you want the best hospitality jobs, you need the best resume. Chin up. It’s not hard to write a great resume for hospitality jobs. Just show the right skills and achievements to fit the offer like a key card in a slot. A hospitality resume example better than 9 out of 10 others. How to write a hospitality resume that gets more interviews. Tips and examples of how to put skills and achievements on a hotel resume. How to describe your experience on a resume for hospitality jobs to fill any opening you want. 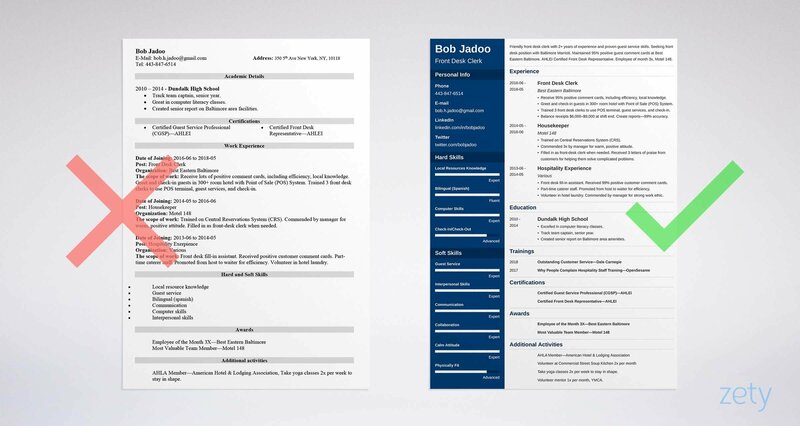 Here's a hospitality resume template made with our online resume builder tool. Looking for a standard hospitality resume sample? The example hotel resume above will book you solid. If you need resumes for specific hospitality jobs, see the 12 great guides and samples below. Just want to make the best resume for a hospitality job on earth? Scroll down. I’ll share piles of tips and samples to write great hospitality industry resumes that’ll help you bag the interview. Use our online resume builder to make your own hospitality resume format for download. What's the Best Format for a Hospitality Resume? The hiring manager just condemned your great hotel resume. Gordon Ramsay wouldn’t use it to shine his shoes with now. It wasn’t your experience or skills. Those are great. You used the wrong hospitality resume format. Format is king in a job where tiny details add up to a great guest experience. 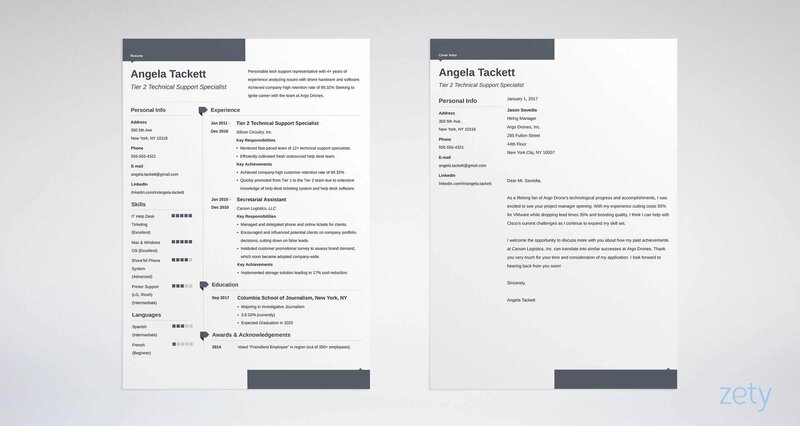 Pick a respected layout like the reverse-chronological resume format. Use big headings, lots of white space, and the best resume fonts. Last, save your resume for hotel jobs as a PDF. Hospitality job resume PDFs look great everywhere and work with ATS systems. MS Word resumes can turn into an unmade bed after you send them. Pro Tip: Scan the hospitality job description to make sure it doesn’t have a no-PDFs policy. Some companies don’t allow hospitality resume PDFs. The HR manager spent half an hour reading your hospitality resume. She’s convinced you’re perfect for the job. Now let’s come back from la-la land. She’s got a pile of resumes for hospitality as tall as the Gevora Hotel to read by checkout-time. She’ll spend six seconds on yours, max. The fix? Grab her attention like a nine-foot “Free Breakfast” sign. Write a resume summary or resume objective. A resume objective shows your passion for the job. Use one if you’re a late arrival to the industry. A resume summary proves your worthiness with experience. Write one if you’ve got ballrooms-full. Either way, stuff it with pulse-quickening accomplishments. Even with no experience, your resume for hotels doesn’t have to seem half-baked. Efficient front desk clerk with proven guest service skills. Received 99% positive comment cards as front desk fill-in at Motel 148. Commended by manager of Red Roof Inn for strong work ethic as volunteer in hotel laundry. Skilled in POS terminal use and fluent in Spanish. Extremely hard-working front desk clerk, skilled in local resources knowledge and computer skills. Fluent in Spanish. Good at providing exemplary guest service and operating POS terminal. That first hotel resume sample could get you in at a Hyatt Regency. The second? Maybe Fawlty Towers. Where did a newbie get that much hospitality industry resume experience? He used transferable accomplishments. I’ll show how in a minute. Now what if you’ve already got experience? In that case, write a resume summary. One of these professional hospitality resume samples fails inspection. Presentable front desk clerk. Responsible for all front desk duties at Motel 148, including POS terminal operation, check in, check out, providing guest assistance, and communicating with other hotel staff. Skilled in local resources knowledge and have exemplary interpersonal skills. What’s wrong with that? Nothing, by itself. But put it in a pile of 300 others and it blends into the wallpaper. It needs details and measurable achievements. Friendly AHLEI Certified Front Desk Representative with 2+ years of experience and proven guest service skills. Seeking front desk position with Baltimore Marriott. Maintained 95% positive guest comment cards at Best Eastern Baltimore. Employee of month 3x at Motel 148. Strong interpersonal skills and check-in/check-out skills. Way to go. The hiring manager just dropped her copy of Without Reservations in her jackfruit salad. Pro Tip: Got stage fright? Soft-open your hospitality resume objective or resume summary. Write it last and build it from the highlights of your resume. Is experience important in resumes for hospitality jobs? Only as important as food and lodging. Don’t have it? Don’t panic. I’ll show you how to use transferable achievements. But you’ve got to list them right or the hiring manager will ditch you like a bathrobe with a burn hole. Show your last job first, with 3–5 resume bullet points that fit the job. The next two entry-level hospitality resume examples show how. Received 95% positive guest ratings for efficiency and local knowledge. Greet and check-in guests in 300+ room hotel with Point of Sale (POS) System. Train 3 front desk clerks in POS terminal, guest services, and check-in. Balance receipts of $6,000–$9,000 at shift end. Create reports w/99% accuracy. The hiring manager would need a vacancy between her ears to trash your application. Your professional front desk duties resume just proved your worth. With a couple management achievements, that could even be a good front desk manager resume. Greet and check in guests with Point of Sale (POS) System. Responsible for providing local knowledge tips to guests. Provide guests with key cards and directions to rooms. Balance receipts and create reports. Hmm. Maybe they’re hiring at the Bates Motel. And if you have no experience at hospitality jobs? Check out the next two entry-level hospitality resume examples. How do you break into the hospitality industry? Are you locked out for good? Transferable accomplishments are your master key to great hotel jobs with no experience. Volunteered at a hotel laundry? Any of those make great experience for a hotel resume. See the next two entry-level hotel resume samples. Which of these two front desk resume examples is more Bridal Suite than Basement Level? Front desk fill-in assistant. Received 99% positive customer comment cards. Part-time caterer staff. Promoted from host to waiter for efficiency. Volunteer in hotel laundry. Commended by manager for strong work ethic. Hospitality Experience: Haven’t officially held any hospitality jobs, but please believe I’ll do a great job. That first one could get you hired at the Marriott in Rivendell. The second? Maybe the Overlook needs help. You must show experience in hospitality-related tasks, even if you’ve never held a job. Pro Tip: You don’t need 5 years of experience to write a good resume for front desk jobs. Even filling in for a few front desk shifts can build your resume. In a resume for the hospitality industry, education isn’t as important as experience. But schooling is a V.I.P. pass that can get you through the door. Maybe you’ll get hired as a bellhop at the Econo-Host in Gotham City. Excelled in computer literacy classes. Track team captain, senior year. Wrote a senior report on Baltimore area amenities. Pro Tip: Do you need to show your GPA in a hospitality resume? If it’s recent and impressive, yes. Otherwise, save the space for Wyndham-worthy achievements. Say hello to the HR manager. Her name’s Stacy. Near it sit 250+ hospitality resumes. She’d like to torch them all. Know why? They all list the same hospitality skills. They’re almost carbon copies of each other. Then she sees your front desk clerk resume. You’ve done something so smart, so simple, Stacy chuckles. What was your big win? You picked exactly the right skills, then you proved them. You list those, plus computer skills and check-in/check-out to add a little value. Used Central Reservations System (CRS) with (1) 99% accuracy. Commended 3x by manager for warm, (2) positive attitude. Received 3 letters of praise from customers for helping them (3) solve complicated problems. The HR manager would trust you to staff a front desk on Mars. Let’s kick off your interview parade with a list of hospitality resume skills. They make great resume keywords too. Add more from hospitality jobs online. Hospitality jobs pay $15.97/hr on average. To make more, you need to prove high-level skills. Pro Tip: You need interpersonal skills to get hired, but you can’t say, “I have interpersonal skills.” Maddening? That’s why achievements matter in resumes for hospitality. 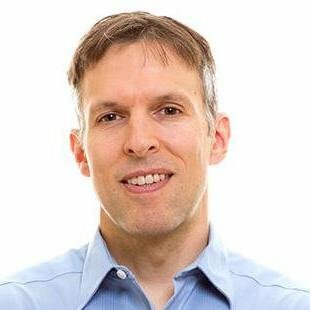 Think your resume is unique? Think again. Hiring managers hate cookie-cutter resumes. You need to prove you’ve got all the amenities. To do that, list awards, trainings, physical activity, certifications—anything that shows real magic. Put them in “other” sections in your hospitality resume. Each one should dazzle like the Grand Budapest Hotel. Take yoga classes 2x per week to stay in shape. Volunteer mentor 1x per month, YMCA. That right example will fast-track you to the top floor. Need a few hospitality resume builders? The AHLA offers certifications and even a hospitality jobs search engine. Dale Carnegie courses only take an hour. Pro Tip: Experience and education often look like walls of text to hiring managers. The more headings you include, the more eye-time your resume for hotel jobs will get. What About a Hospitality Cover Letter? Do you need to send a cover letter with your hospitality resume? About 45% of hiring managers toss no-cover-letter resumes. Make it short. Make it personal. Make an offer. Start with the hiring manager’s name. That’ll catch her eye like a stack of 20s on the lobby carpet. Show you’re the solution. That means sharing your best accomplishment. Always end a cover letter with an offer. Try, "I'd enjoy the opportunity to share how I earned ten letters of praise from guests." Once your cover letter is ready, run a sanity check to follow these 5 best practices of hospitality cover letters from BENCHMARQUE. They've read over 10,000 cover letters for hospitality jobs. Pro Tip: Should you follow up on a hospitality resume and cover letter in 3 days or a week? Umm... both? As long as you don’t overdo it, each follow-up is one more chance to land the interview. You even know "professional email address" means no ILoveGoatYoga2382349023@yahoo.com. These days, 87% of recruiters use LinkedIn when they hire. It lets them see your back-of-house before they interview you. Pro Tip: Your LinkedIn profile is as crucial as a comfy lobby. Make sure it’s in working order with our guide to optimize your LinkedIn profile. Sell your best stuff first. A hospitality resume objective or resume summary will grab the hiring manager’s attention. Read the job description. Stitch your bullet points to the job ad like a hotel logo to a stolen bathrobe. Add other sections that prove you’re great to work with. On a hotel resume, that means commendations, certifications, and professional associations. Write a hospitality cover letter. Convince the hiring manager you fit her needs. Do you have questions on how to write a great resume for hospitality jobs? Not sure how to describe your skills or achievements? Give us a shout in the comments! We’d be happy to reply.